Blackadder's Christmas Carol is a one-off episode of Blackadder, a parody of Charles Dickens' A Christmas Carol. It is set between Blackadder the Third (1987) and Blackadder Goes Forth (1989), and is narrated by Hugh Laurie. Produced by the BBC, it was first broadcast on BBC1 on 23 December 1988. 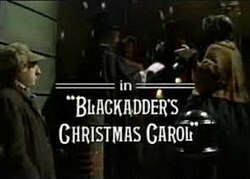 Title screen of Blackadder's Christmas Carol. Ebenezer Blackadder (Rowan Atkinson), the Victorian proprietor of a "moustache shop", is the nicest man in England. He is everything that Ebenezer Scrooge was by the end of the original story: generous and kind to everybody, and sensitive to the misery of others. As a result, people take advantage of his kindness—Mrs. Scratchit and an orphan take all his money, and a beadle takes his food. All but Mr. Baldrick (Tony Robinson) view him as a victim. His business turns no profit, all his earnings going to charity and to con artists, and he lives a lonely, miserable life. One Christmas Eve, Blackadder's destiny changes when the Spirit of Christmas (Robbie Coltrane) visits him to congratulate him for his ways. The spirit lets him see shades of the past: his ancestors Lord Blackadder and Mr. E. Blackadder, Esq. Instead of being convinced that he is better than them, he grows to admire them and their wit. He asks the spirit to show him what could happen if he became like them. He sees a vision of a distant future where his distant descendant Grand Admiral Blackadder is a successful and ruthless official of a Galactic empire (with Baldrick as his semi-naked slave) who is about to marry the similarly ruthless and insanely ambitious Queen Asphyxia XIX (Miranda Richardson) after murdering her "triple husbandoid". Blackadder asks the Spirit what will happen if he stays as he is. He is shown an alternative future in which his descendant is the semi-naked slave of the incompetent Admiral Baldrick. Blackadder proclaims, "Bad guys have all the fun." He wakes up a different man: bitter, vengeful, greedy, and insulting to everyone he meets. Now in control of his life, he misses an opportunity when he insults two strangers: Queen Victoria (Miriam Margolyes) and Albert, Prince Consort (Jim Broadbent), who were about to award him £50,000 and the title of Baron Blackadder for being the nicest man in England. They leave without doing so after being ridiculed by Blackadder. The episode ends when Blackadder's extravagant Christmas dinner with Baldrick is ruined when Baldrick informs him of the identities of the strangers and shows him the royal seal. Most versions[specify] of this special edit Baldrick's speech about a dog being used as Jesus for the Nativity play to remove a line in which Baldrick says the dog will be nailed to a cross for Easter. The earliest known case of this edit was on its first rerun in December 1989. The same version was used for later terrestrial broadcasts when the special aired on Christmas in the years 1998, 2007, 2008, 2010, and 2012. The edited version is also seen in the Blackadder Ultimate Edition DVD set, on the UK channel Gold since 2018 (the uncut version was screened until 2017) and, as of 2016, is on Hulu Plus. The original uncut version can be seen on the Region 1 U.S. DVD set, and on the U.S. and UK versions of Netflix. ^ Referred to on the DVD cover as "Awful Screeching Woman." ^ Referred to on the DVD cover as "Giggling Ninny."